At 2 p.m. ET today, the Federal Reserve (Fed) released the latest edition of its Beige Book. The Beige Book compiles qualitative observations made by community bankers and business owners about economic and banking conditions in each of the 12 Fed districts. The report is much more “Main Street” than “Wall Street” focused, and provides an excellent window into economic activity around the nation using plain, everyday language. The report is prepared eight times per year, ahead of each of the eight Federal Open Market Committee (FOMC) meetings. The next FOMC meeting is September 20–21, 2016. The data for this edition of the Beige Book was collected through August 29, so it incorporates a full two months of post-Brexit data points after the United Kingdom’s (U.K.) unexpected vote to leave the European Union (EU) on June 23, 2016. There was just 1 mention of “Brexit,” the U.K., and/or the EU in this edition of the Beige Book—well below the 9 mentions in the Beige Book released in early July. Meanwhile, there were 8 mentions of the upcoming presidential election and/or politics in the Beige Book, almost all in a negative context. We expect even more mentions in the next Beige Book as the November election approaches. To evaluate the sentiment behind the entire Beige Book collage of data, we created our proprietary Beige Book Barometer (BBB) (see the figure below), which is a diffusion index that measures the number of times the word “strong” or its variations appear in the Beige Book less the number of times the word “weak” or its variations appear. When the Beige Book Barometer is declining, it suggests that the economy is deteriorating. 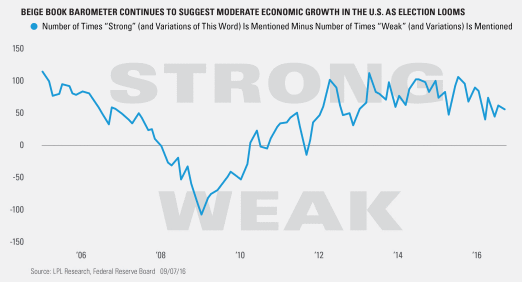 When the Beige Book Barometer is rising, it suggests that the economy is improving. In September 2016, the barometer ticked down to +55 after the +61 reading in July 2016. At +55, the September 2016 reading is now back in the middle of the range it has been in since early 2012. All of the deterioration in the Beige Book versus July’s came in the three Fed Districts in the nation’s oil patch (Minneapolis, Dallas, and Kansas City), despite a pickup in oil production in the past few months. Our Oil States Barometer moved from +21 in July to just +7 in September, matching the +7 reading seen, on average, in the 8 Beige Books ending in June 2016, which coincided with the worst of the declines in oil production and prices. The +7 reading in September was even more disappointing given that the +21 reading in July put sentiment in these districts back to a level not seen since prior to the peak in oil prices in June 2014. Please see our next Weekly Economic Commentary (September 12, 2016) for more insights into the Beige Book.